Hello, I'm Jared Mauch. I used to operate a system called nether.net. It was the largest public-access Unix systems with the least restrictions on the internet. I've been doing work on/around the internet since late 1991, and currently work for NTT America.net where I am employed as a Senior IP Engineer operating our global network. I've got a nice cat named Pinky, who can be a fairly lazy cat. 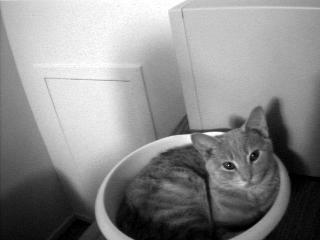 He likes sleeping in my big bowls, the corners and otherwise doing other things that cats do. Here's a pretty good shot of the cat looking at the camera. It's not that bad of a shot, probally the best you can get a cat to do between naps.